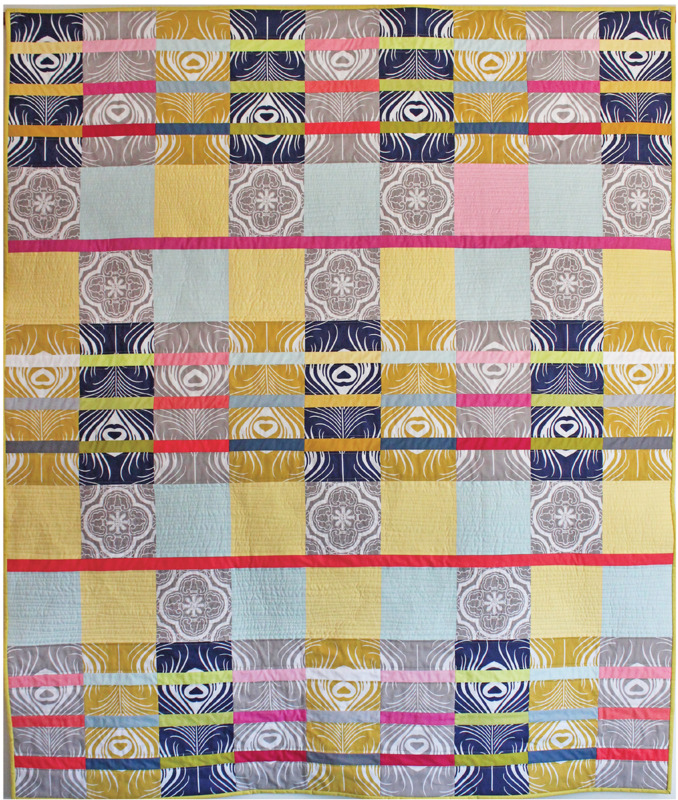 We're so excited to feature Quilts of Florida ! 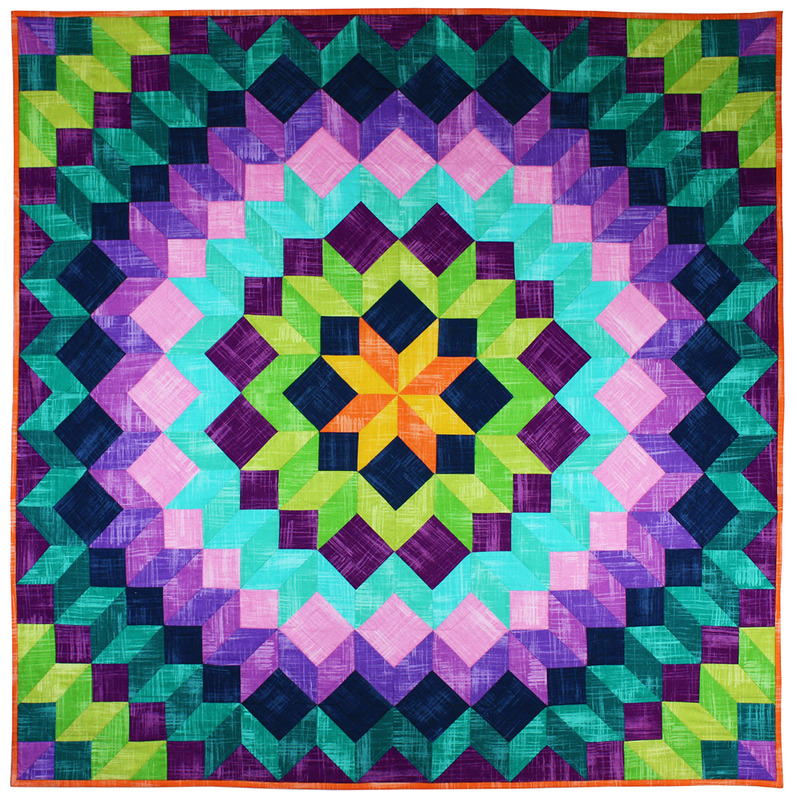 As you may know, Florida is the Sunshine State, and many Florida quilters have incorporated bright colors in their entries - along with some impressive workmanship! 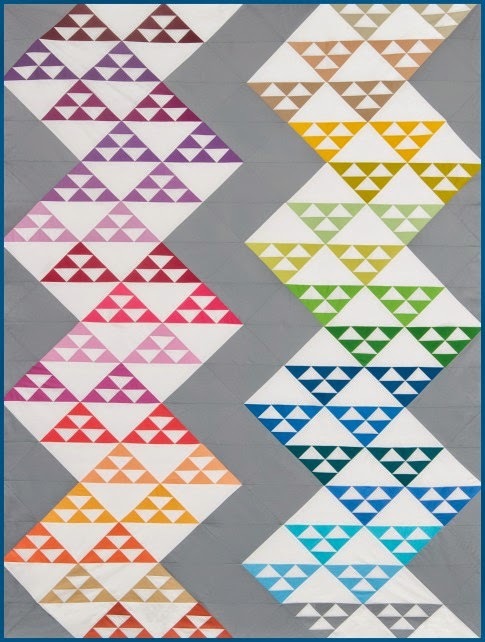 All of these quilts were exhibited at the January 2015 World Quilt Show in West Palm Beach. 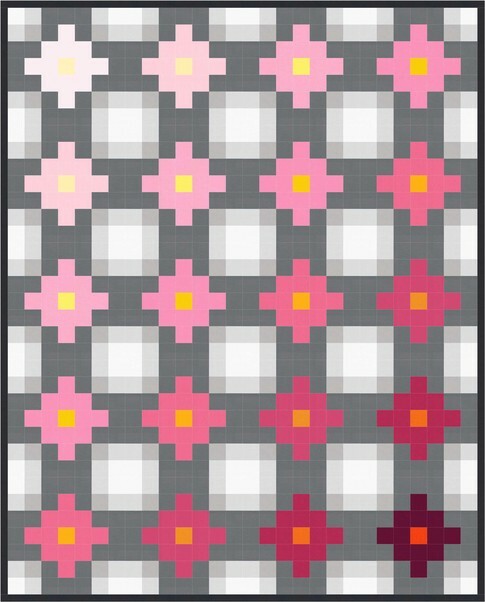 Here's a charming quilt that was part of a special exhibit on using light and dark grays as a neutral background. 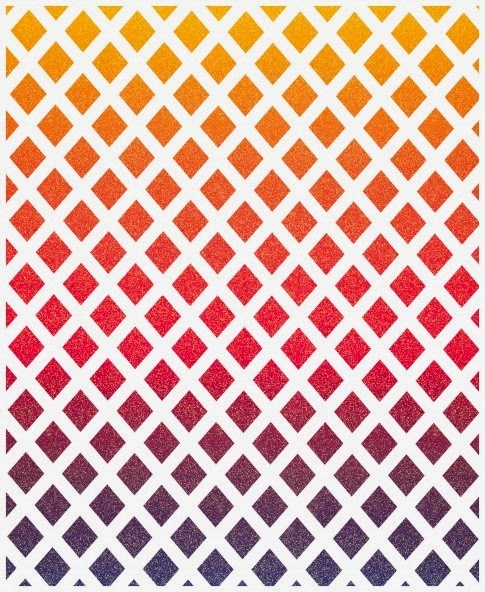 Sarah explains, " [This background with its varied neutral hues] are the perfect colors to offset a rainbow colored crossword of inspiring thoughts." 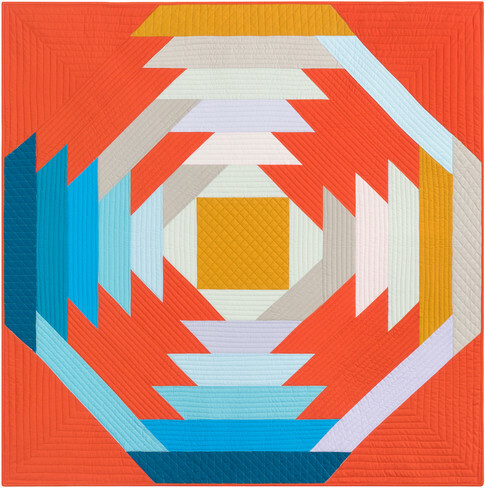 We love how the border's secondary and tertiary solid tones of orange, aqua blue, and lime green complement the warm and cool hues of the quilt's focal point. 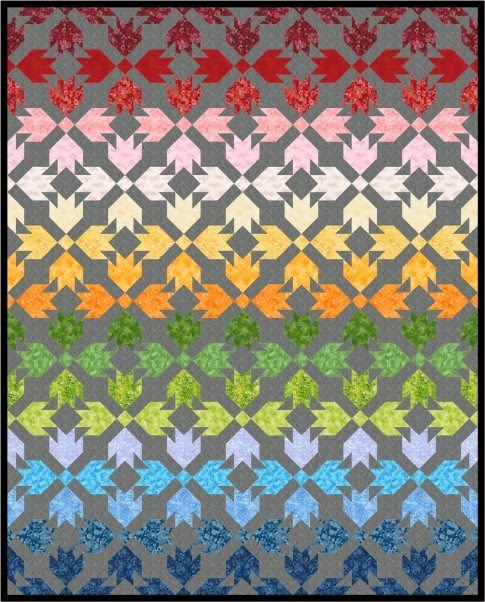 This crossword puzzle quilt is based on the Express Yourself embroidery designs by Sarah Vedeler. 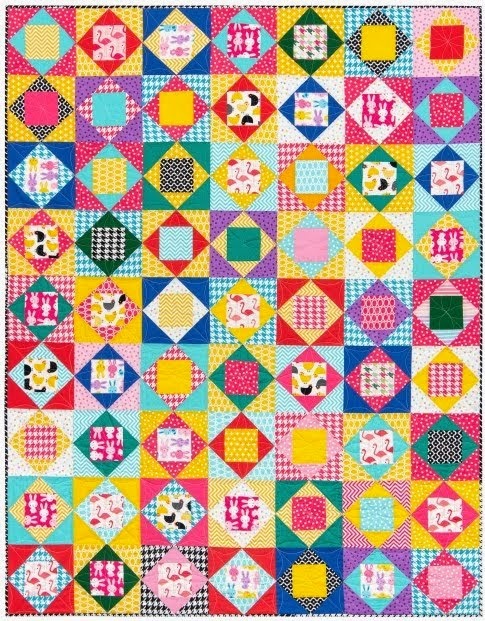 Each block of this cheerful quilt has its own quilting motif, and each letter has its own style of machine embroidery. 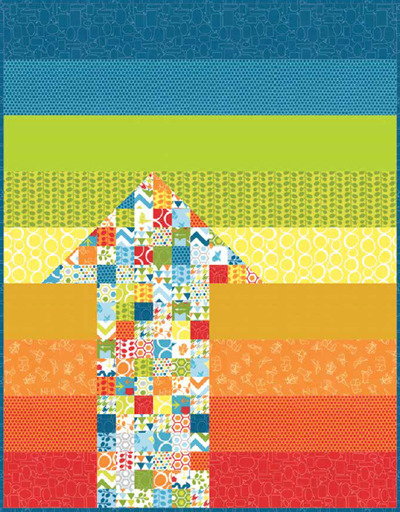 This positive and uplifting words really "pop" against the subdued, nuanced background fabrics. 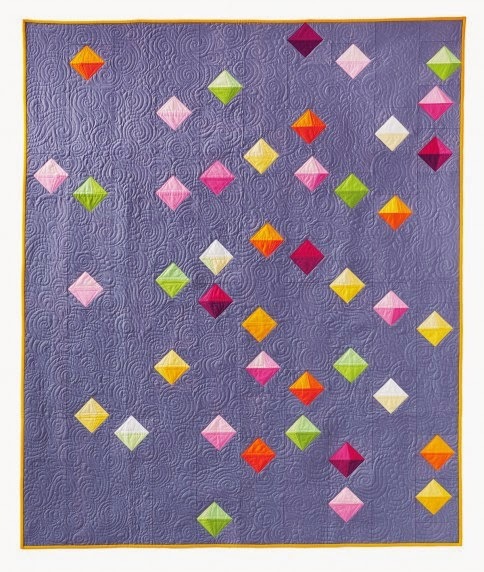 Third place winner in the Florida Quilt Competition, Debra says, "[I used] hand dyed fabric for applique and a silk background. Some applique motifs were designed by Deborah Kemball. 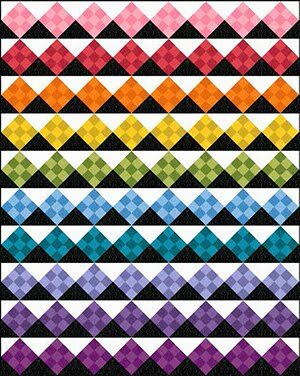 The border quilt design is by Sharon Schamber." We imagine spring wildflowers gently dancing in the breeze, as the first blossoms of the season come to life. A variety of intricate quilting patterns are used to embellish this delightful and elegant work, including blanket stitch and satin stitch. 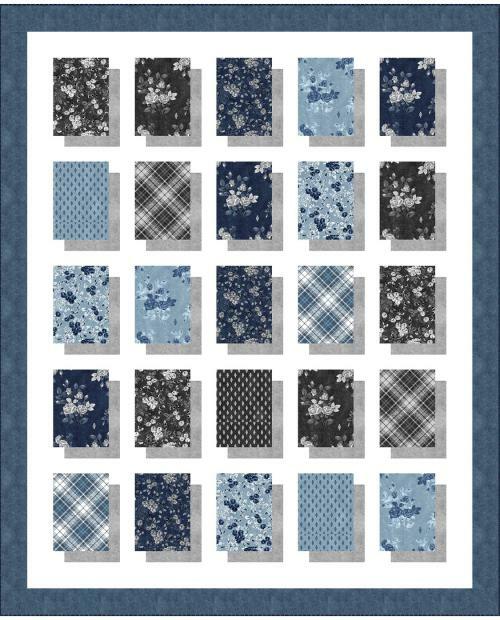 Debra's original design is machine appliqued and machine quilted. 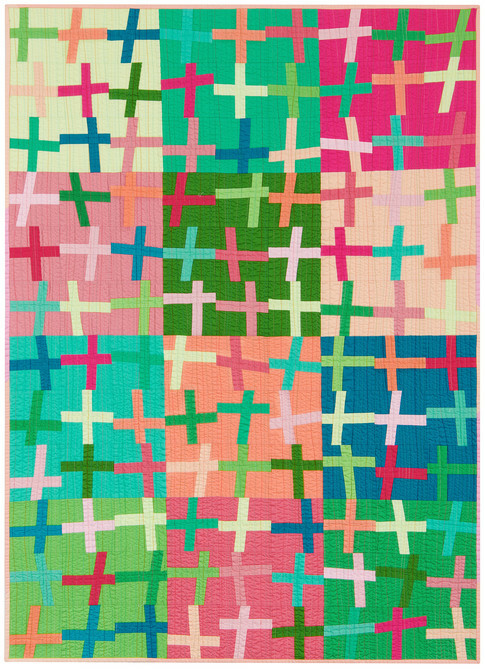 Louise explains, "I'm a very traditional quilter and found it hard to 'go Modern'. 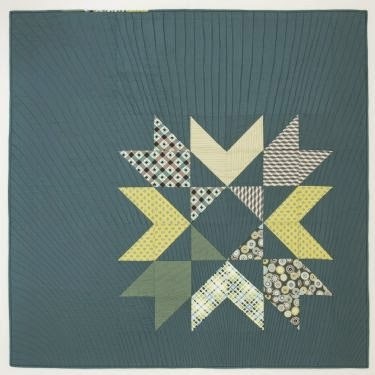 Then I saw this [Easy Breezy Hexies] design by Sonja Callaghan and felt it was modern but still let me feel comfortable in my traditional roots." 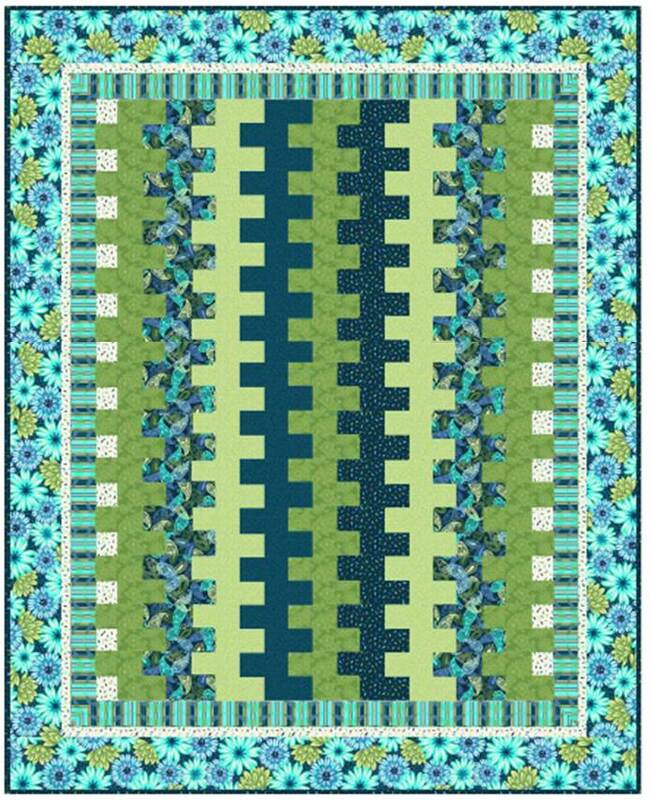 Louise's use of solids and striped fabrics, along with a pale gray and white background lend a three-dimensional perspective to this well-loved pattern. The saying "Everything old is new again" is really exemplified by Louise's contemporary craftsmanship. 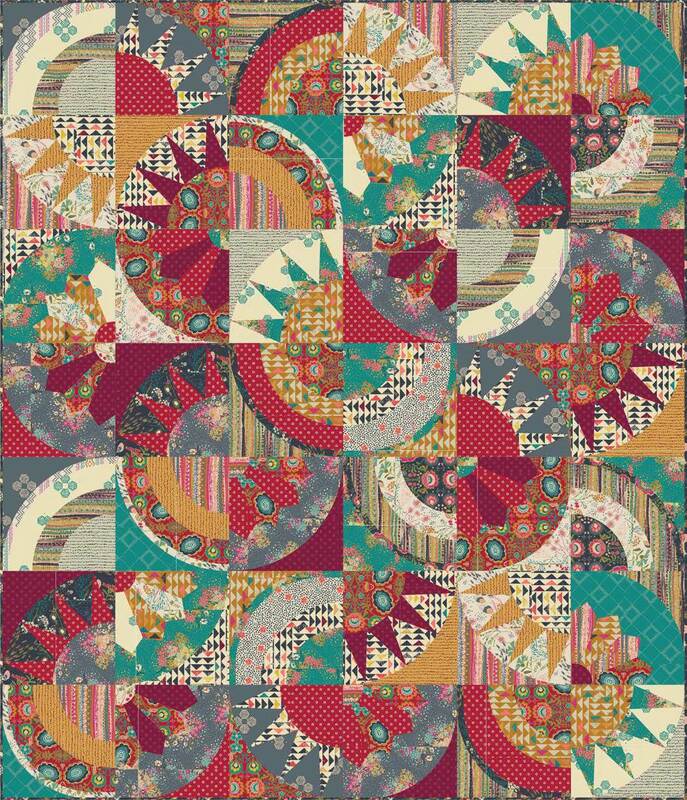 Triangular, parallel line, and small circle quilt patterns give this vintage pattern such a refreshing, updated look. 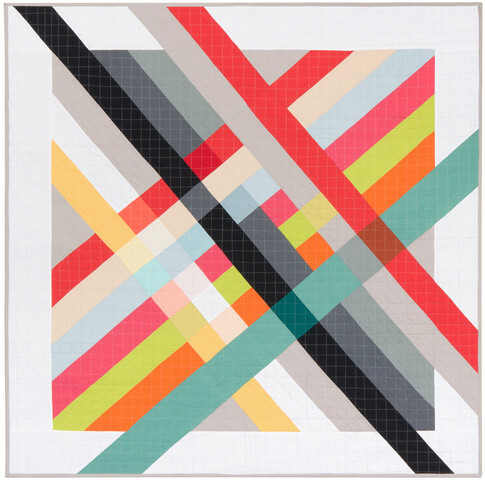 Louise adds, "While I would normally hand quilt this, I decided to quilt this by machine." We think the results look spectacular ! 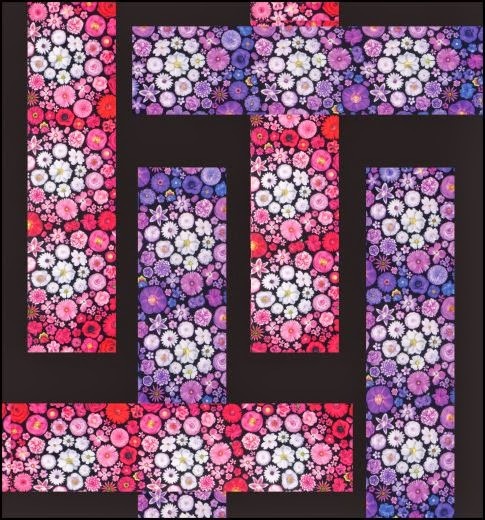 This exuberant floral quilt by Phyllis Goffe was inspired by her garden. 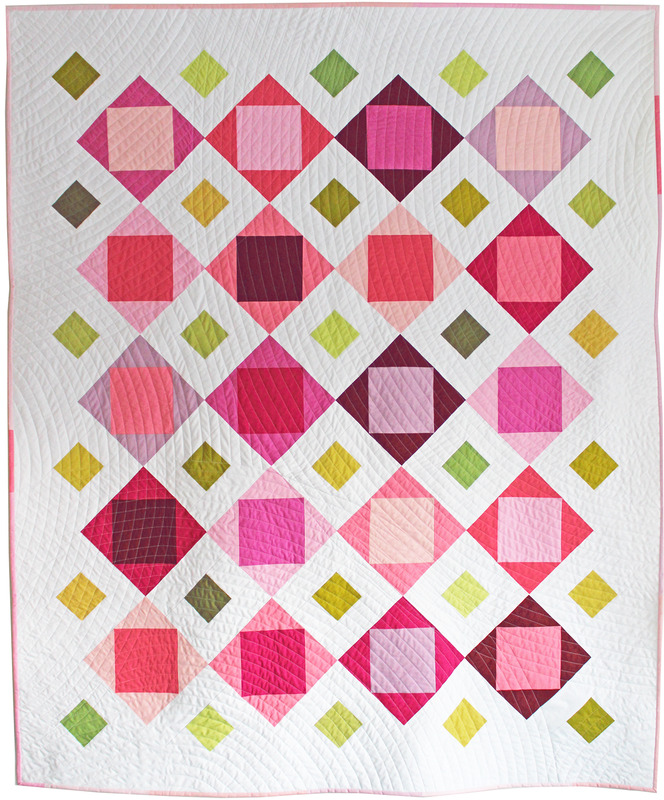 The border is made with a tropical hibiscus print in red, pink and green that complements all the colors of the quilt. 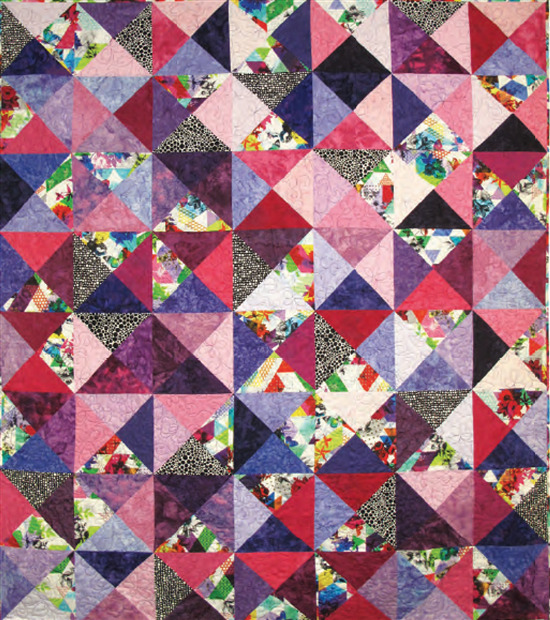 The center of the quilt is dominated by three bright red hibiscus flowers that are machine appliqued on a silver-gray background. In Phyllis' original design, bigger-than-life size flowers and leaves were embellished with an array of fun embroidery stitches.This look is so lively and tropical, that Phyllis's flowers are imbued with a personality of their own. 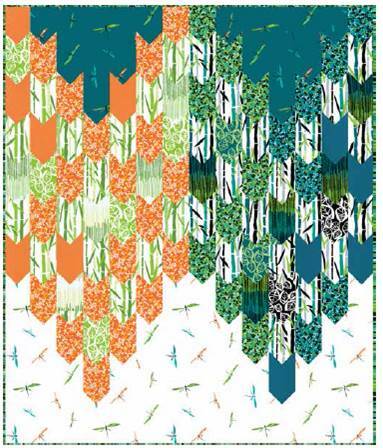 Kim explains, "I chose this pattern because the New York Beauty design always intrigued me. This is the first guild challenge I've participated in since I was asked to join two years ago. I felt this pattern was appropriate because that's how I felt about being asked to join such a talented group: A Point of Pride." 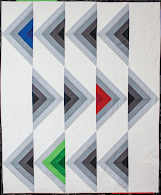 Kim adds, "The quilt (size 76 x 76) consists of 28 gray fabrics and 22 red fabrics. I lovingly refer to it as "the elephant in the room." 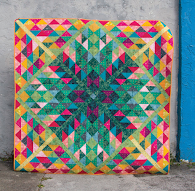 We're so excited to feature Quilts of Florida. 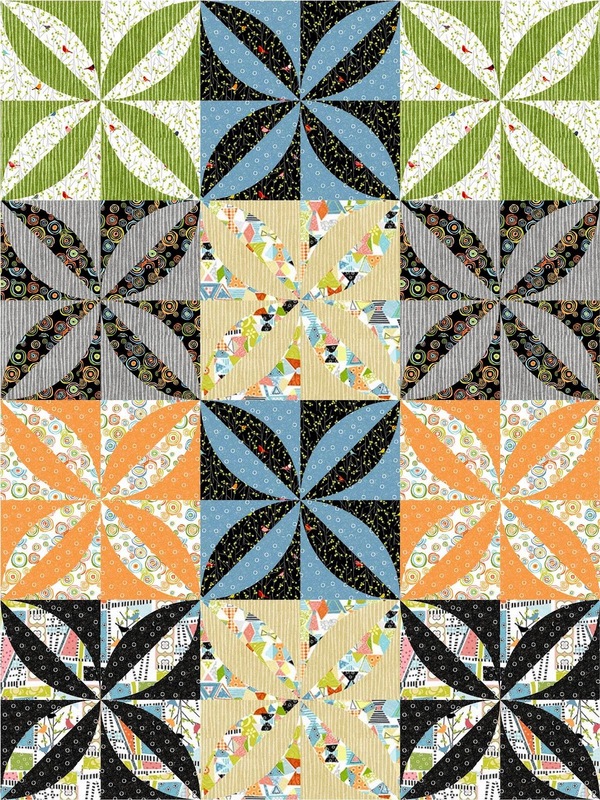 As you may know, Florida is the Sunshine State, and many Florida quilters have incorporated bright colors and sun themes in their entries - along with some impressive workmanship. 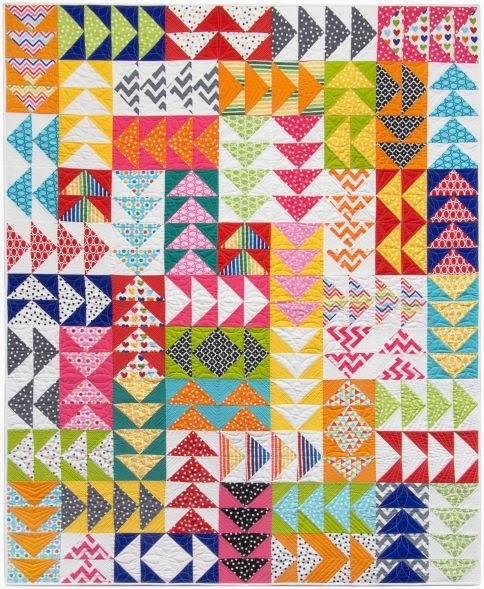 All of these quilts were exhibited at the January 2015 World Quilt Show in West Palm Beach. "Bienvenidos" ("welcome") was a blue ribbon winner and recipient of Curator's Choice for Mixed Technique in the 2014 Hoffman Challenge - and we can see why! Laura Ruiz cleverly used print motifs to create the colorful pots and plates exhibited on shelves behind the girl. Mexican pottery is painted with many intricate details, which Laura captured with her use of Hoffman fabrics. Everything about this quilt was lovely, including the portraiture of the girl with her dark hair, gathered Mexican blouse, and broderie perse flowers. Even her necklace has a floral motif. 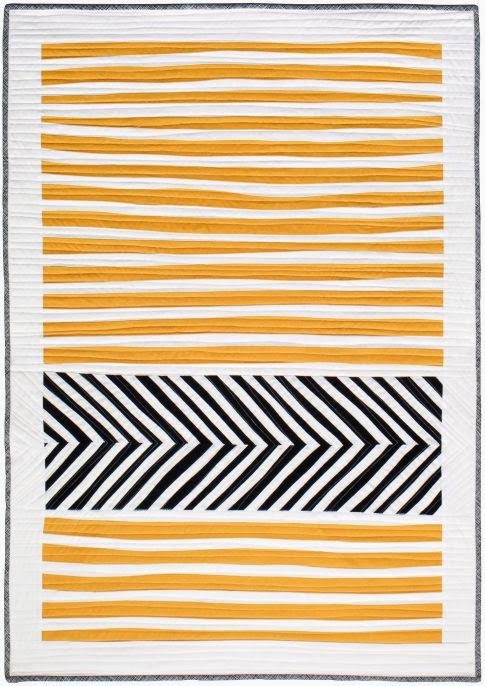 This is one of the most dynamic Storm at Sea quilts we've seen, with its waves of color and a yellow block reminiscent of the sun at the center. 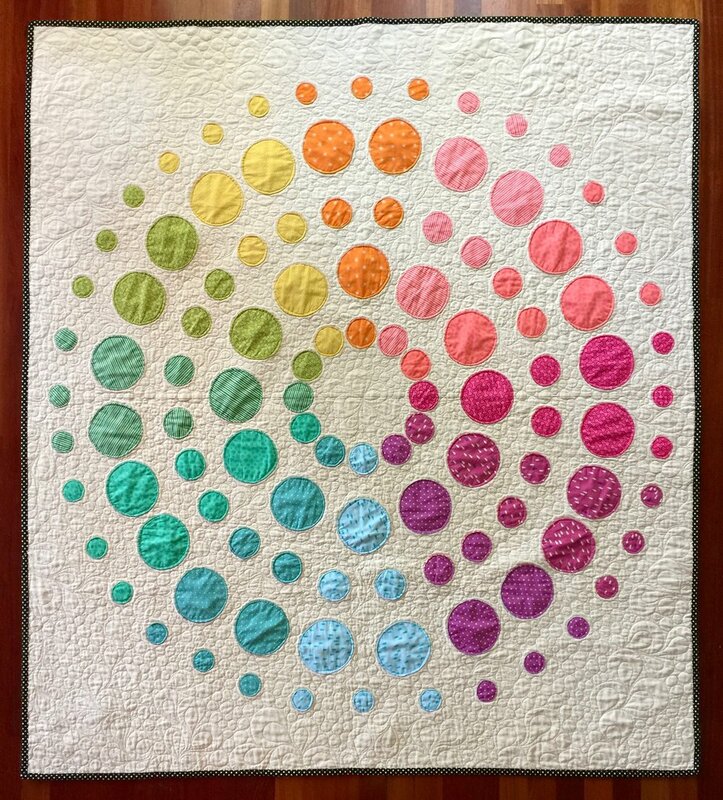 Beth Shutty says, "I arranged my hand dyed fabric so the color radiates out from the central focal point. 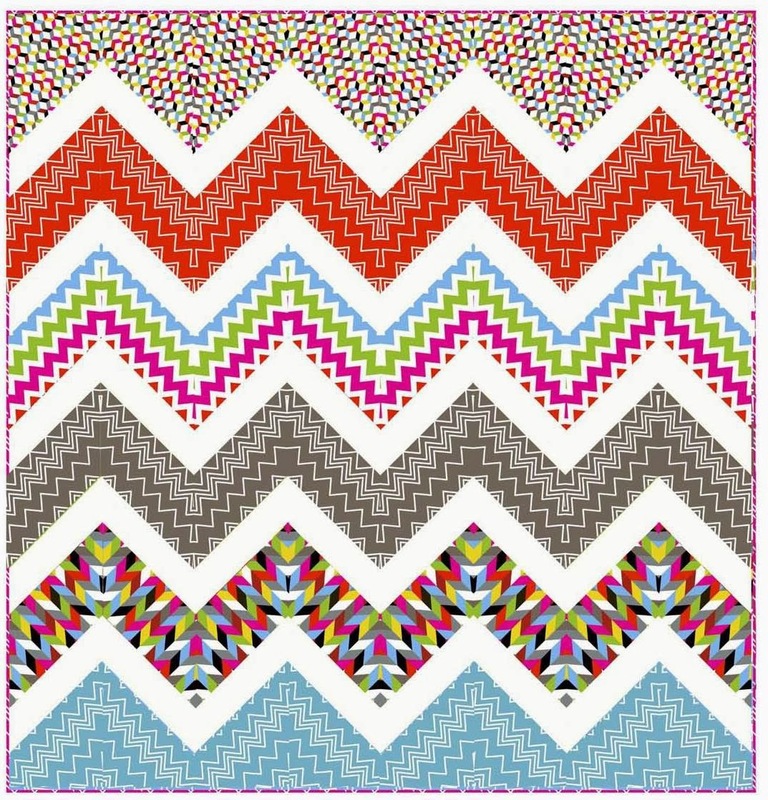 The placement of white patches creates diagonal waves of color which influenced the quilt’s name." 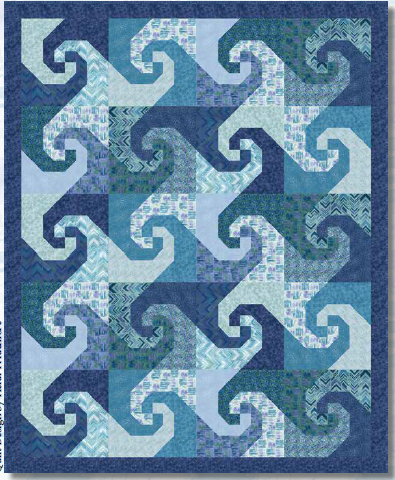 Storm at sea is such a great block pattern, with its straight lines that create the appearance of curves. 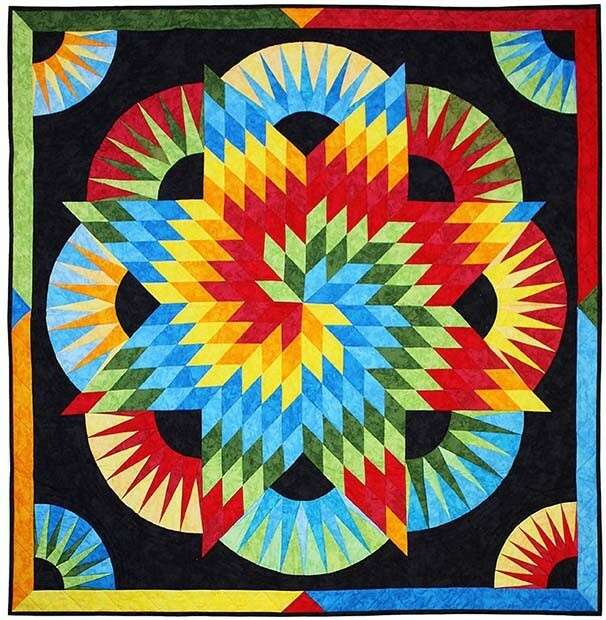 In Color Wave, Beth Shutty's spiral machine quilting adds an additional level of movement and emphasizes the yellow "sun". 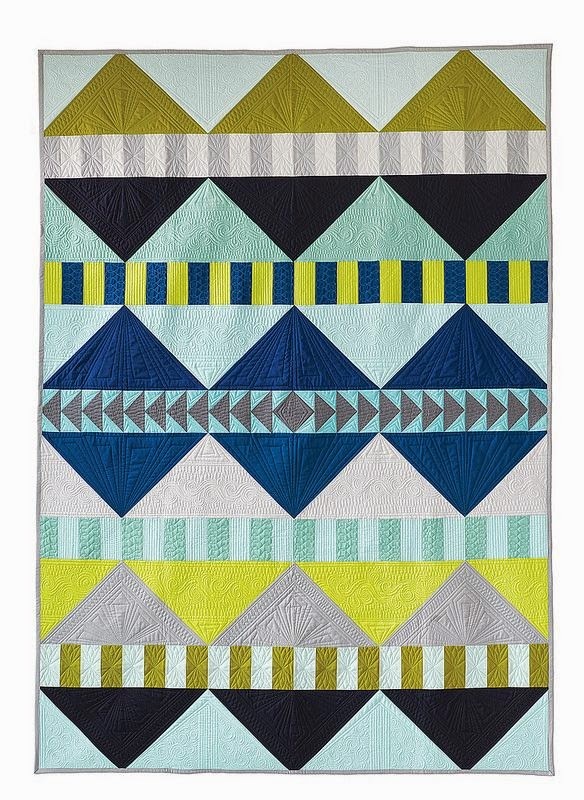 This quilt really makes us smile, with its warm suns that contrast with the cool colors of blue water. Each of the 6 circles is made of 4 blocks. 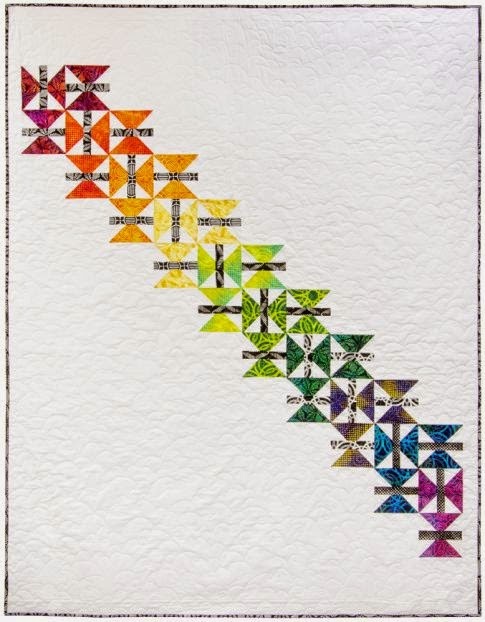 Susan says that she started by experimenting with curved raw edge strips onto 9” blocks onto different layouts, looking at the traditional Drunkards Path pattern for inspiration. She then added the rays, thus creating the ‘suns’. Susan Rienzo says, "The wonderful sunshine in Florida is what brings everyone here to enjoy, either to visit, live part-time or year round! Are you in a Sunshine State of Mind?" Louise Moor says, "Dandelions remind me of my daughter blowing the “puffs” when she was small." Dandelion was hand appliqued. Star-shaped embroidery stitches were used to depict the dandelion heads, as shown in the close up photo below. 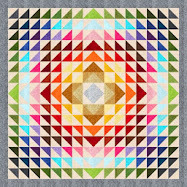 This stunning rainbow quilt won 2nd place in the Florida Quilt Competition. 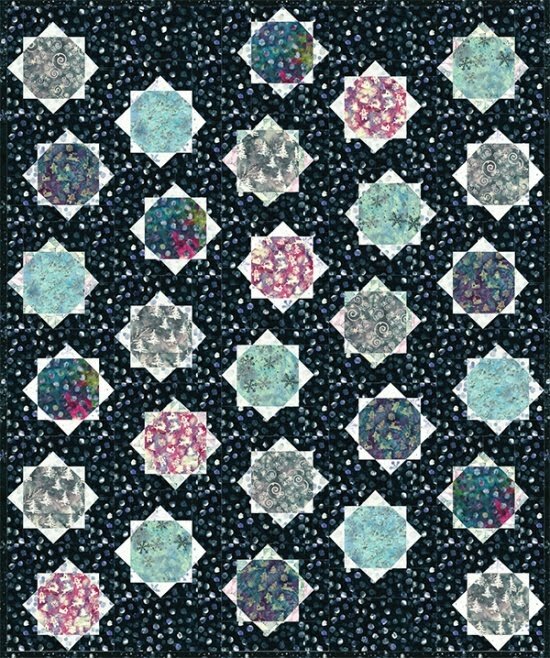 It's often not easy to see the quilting on black backgrounds, but this one really stood out with lovely feathers, lines, and other fills. 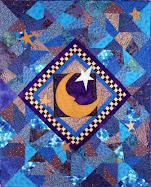 The center feathered star is from a pattern by Marsha McCloskey and the remainder of the quilt is Karen Marchetti's original design. The quilt was hand and machine appliqued, machine pieced, and long arm quilted. 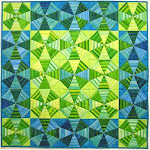 The beautiful trapunto machine quilting really shows up here. Karen says, "This quilt was started years ago. 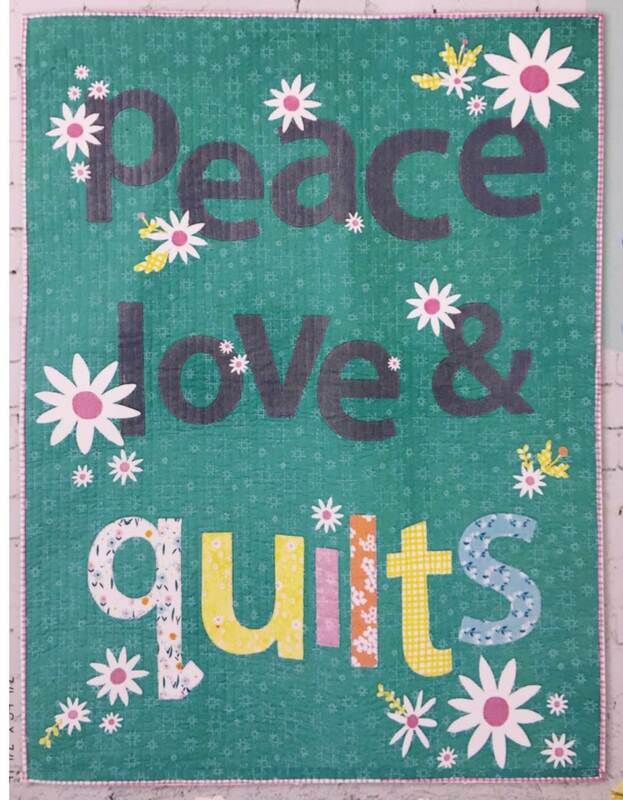 I call it the quilt that refused to be finished because it has given me so many difficult trials... All I can say is that I am happy it is finished!" To read the whole story, please visit Karen Marchetti's website. Let's celebrate U.S. President's Day (February 16, 2015), with a timely quote by George Washington (b. 1732- d. 1799): If freedom of speech is taken away, then dumb and silent we may be led, like sheep to the slaughter. 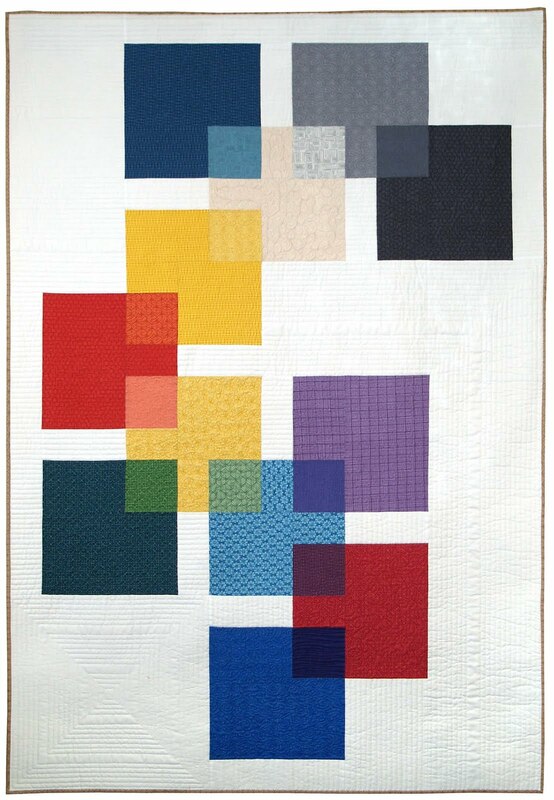 Here is a colorful quilt, which features all of the U.S. presidents! It is hand appliqued and hand quilted, and the Presidents' faces are rendered in black embroidery thread. 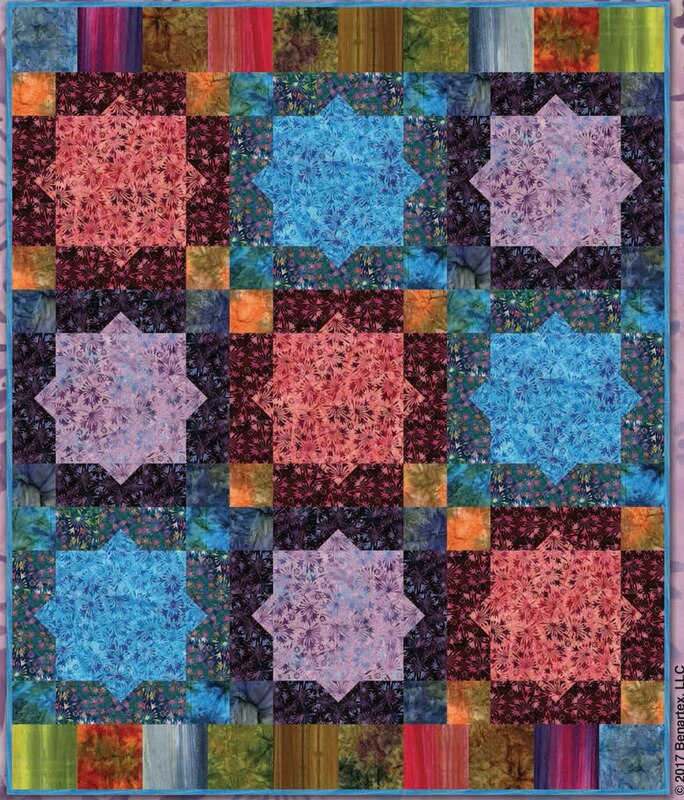 Notice the stars that are quilted onto the border. Justice also appears (below, left). Image credits: Photos were taken by Quilt Inspiration at the 2014 Pacific International Quilt Festival. 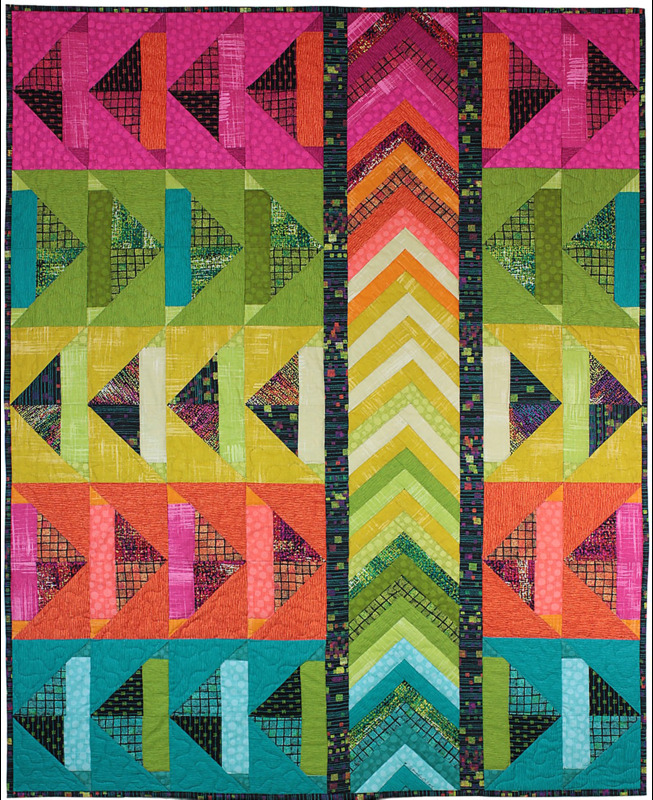 Our good friend Bonita McFadden has created a beautiful wall-size quilt which drew so many admiring looks from viewers at last October's Pacific International Quilt Festival. Bonita used the Broderie Perse method of applique to affix the the elegant roses and butterflies, giving this work a vintage, Victorian look. She even found tiny heart-shaped crystals for the corner valentines, adding to the overall romantic ambience of her creation. 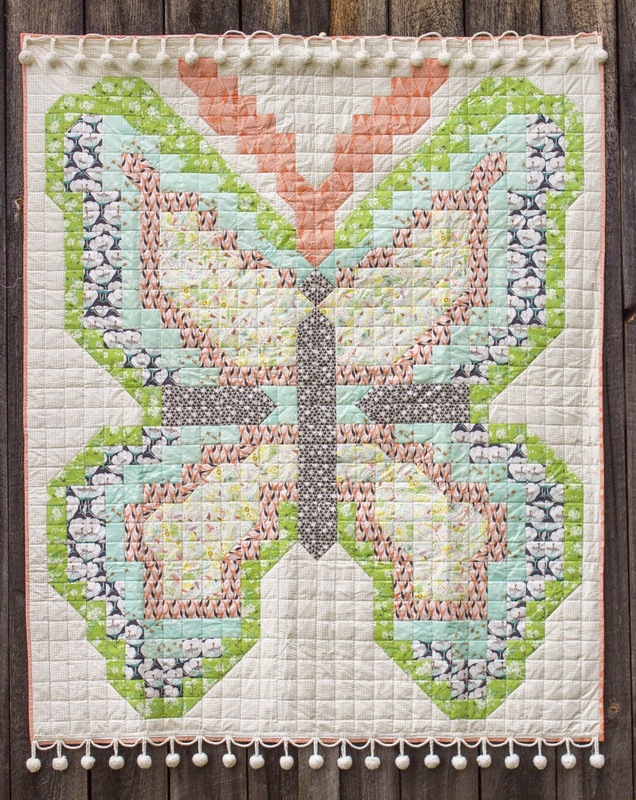 Bonita's original design is machine pieced, machine appliqued, and machine quilted. The center valentine heart is embellished with tiny hot-fix pearls and two separate layers of lace. As always, we enjoy seeing this superb example of Bonita's flawless workmanship. "Ruche" or "Ruched" is a word taken from the French, which in English means "gathered"or "ruffled". Here's a lovely bouquet of red flowers, made from fabric that is folded and pleated in various patterns to create a three dimensional wall quilt. 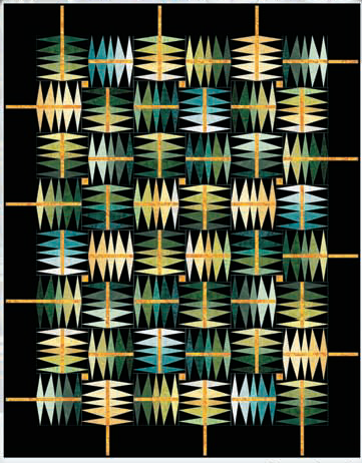 Louise notes that her experience in making stained glass windows helped her create this design in bold colors. 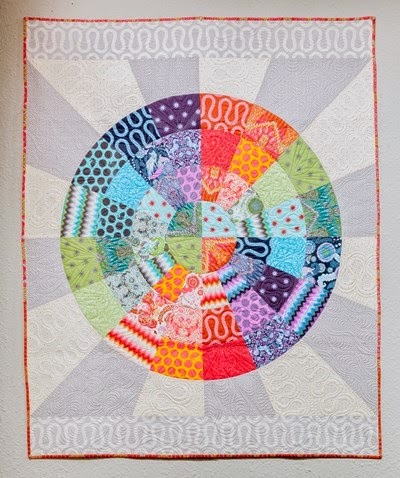 Holly Nichols has quilted this off-white background in swirls and spirals which match the swirls and spirals of the ruched flowers. 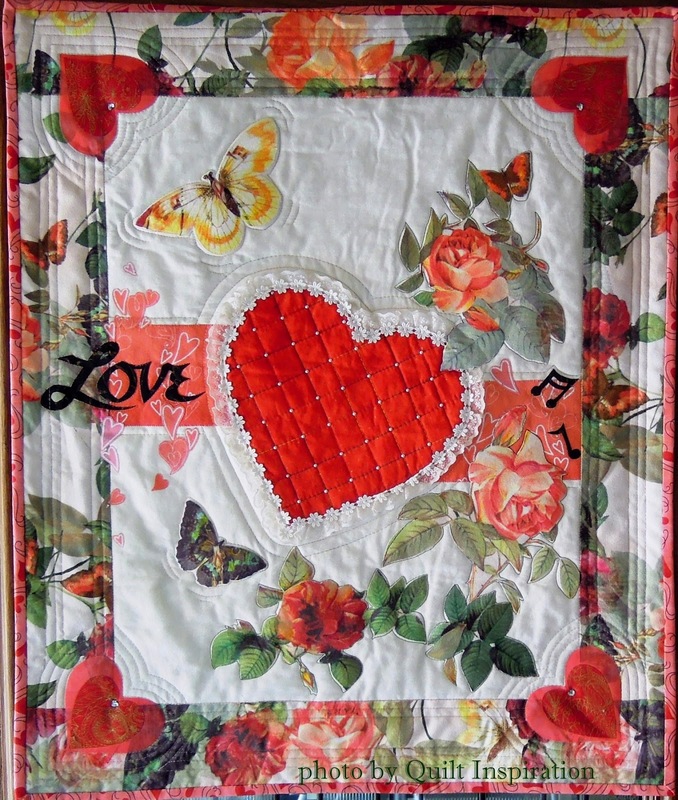 The closely quilted background really helps the miniature valentine hearts pop out between the leaves. 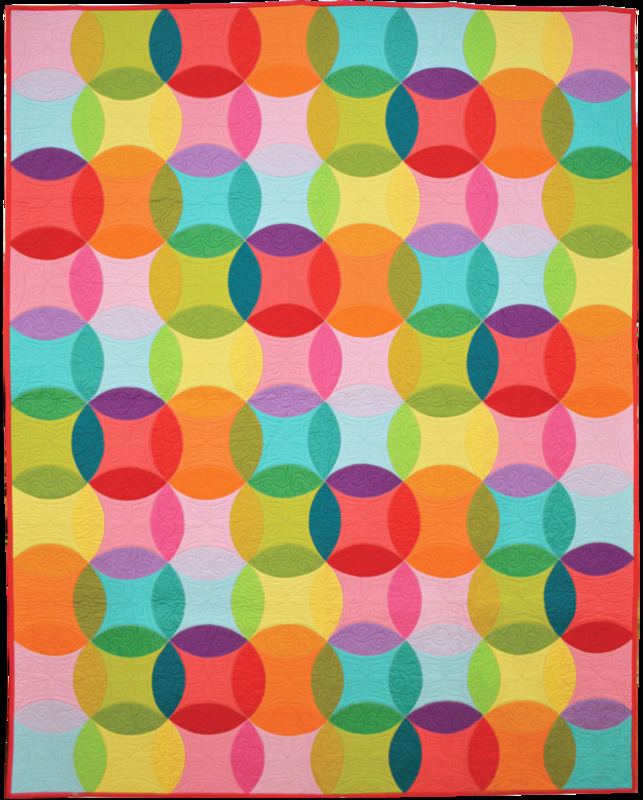 Mary Ann explains, "I was looking through some old quilting magazines and saw this pattern by Ellie Brown in McCall's Quilting Jan/Feb 2012. It was almost Valentine's Day, and I was motivated. Everything I needed was in my stash. 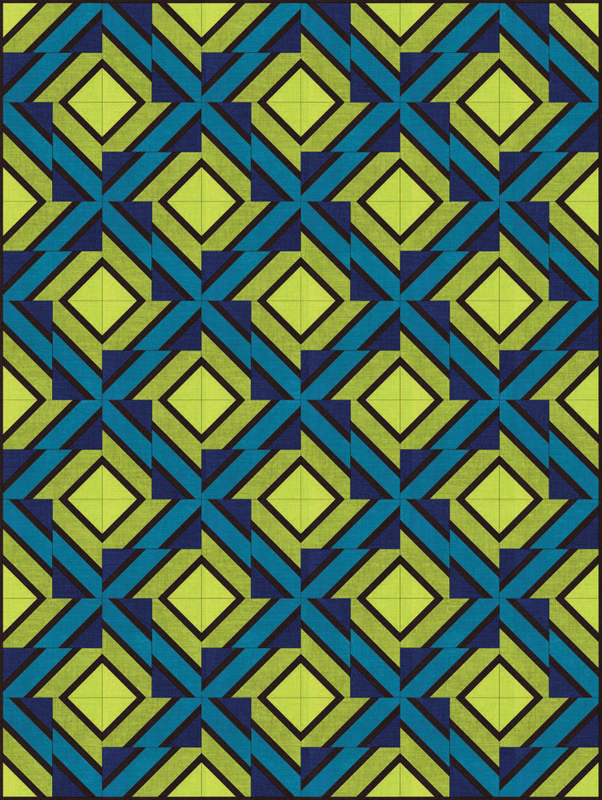 I don't usually follow patterns or do "crafty" types of quilts, so it was a new experience for me. I love walking by it and ruffling the hearts!" We think this three-dimensional "Valentine's tree" with its adorable hinged hearts is one of the cheeriest wall quilts ever. Blue ribbon winner for Best Machine Workmanship, Theresa notes, "This was quilted on a Handi Quilter Sweet Sixteen sit down machine. 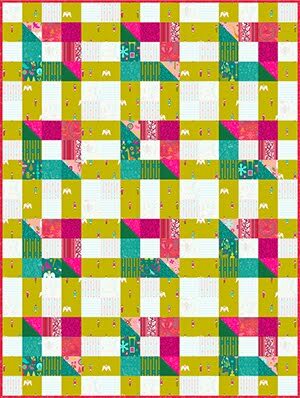 The pattern is Vintage Valentine, a block-of-the-month pattern by Verna Mosquera at The Vintage Spool. I started making this quilt in 2008. I was afraid to mark and quilt it, so it sat for awhile." 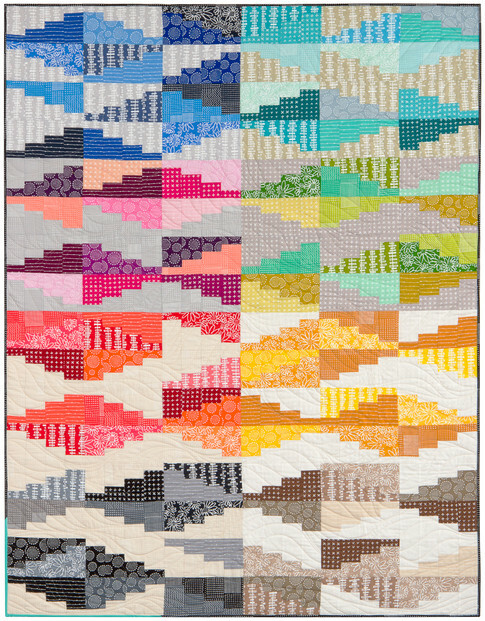 We wish that all of our readers could see this quilt in person, because it is really a breathtaking showstopper. 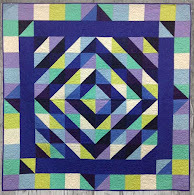 Theresa continues, "After taking free motion quilting classes in person, watching many classes on Craftsy.com, and getting some advice from my friend Karen Marchetti, I finally got the nerve to quilt it." As you can see, the results are absolutely stunning. 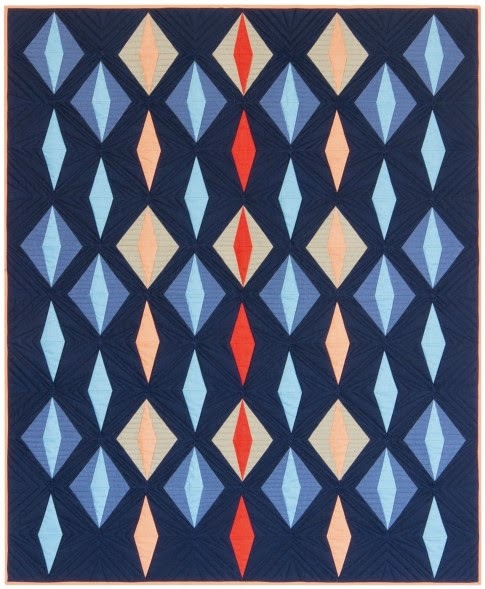 This spectacular quilt will no doubt be a treasured heirloom by its owner. 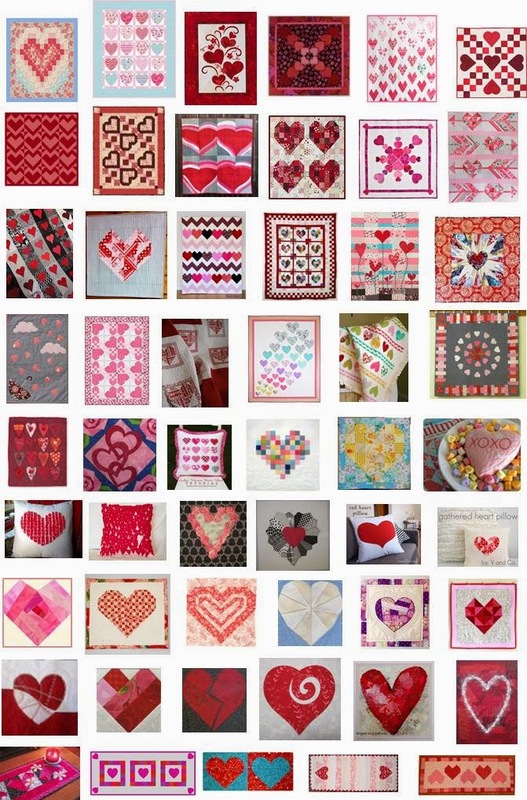 Free hearts and valentine quilt patterns as seen at Quilt Inspiration. Now it's your turn to make something for a special someone, including yourself ! 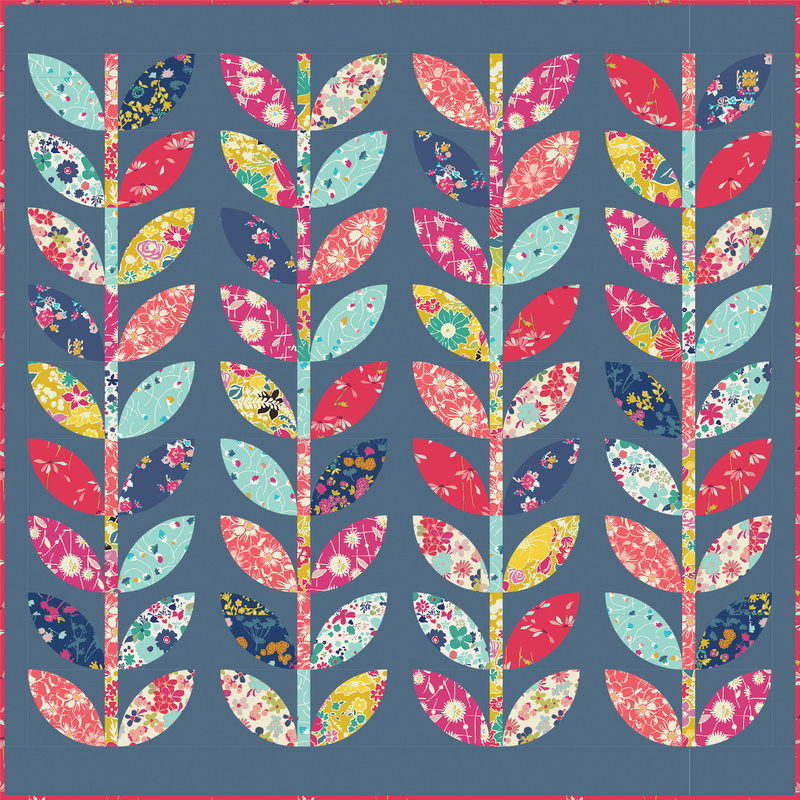 We hope that you find just the right free pattern from all the pretty ones shown below. 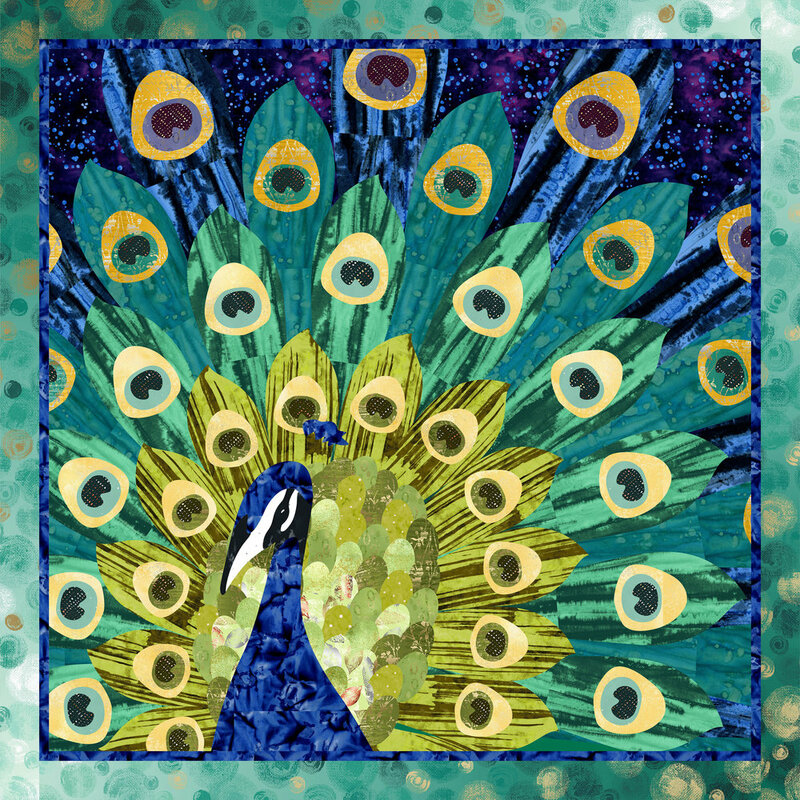 Florida's World Quilt Show in West Palm Beach is a great event to attend, amidst the warmth and sunshine, while most of the U.S.A. shivers under winter's blanket. 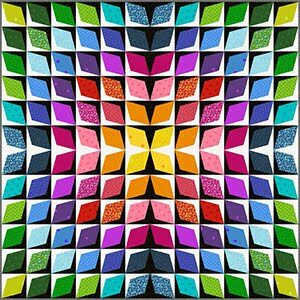 We marveled at all the spectacular quilts from around the globe! 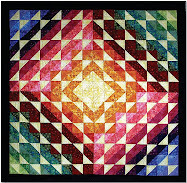 Planet Earth indeed holds a huge variety of wonderful quilting talent. Here is our 4th and final post featuring the show. Winner of both the Viewer's Choice Award and an Honorable Mention in the Innovative Quilts category, this quilt depicts an ancient Greek myth. Marilyn explains, "When Cassiopeia's [pride] leads her to boast that her daughter Andromeda is more beautiful than the Nereids (the female spirits of the sea waters), King Poseidon chains Andromeda to a rock and sends a sea monster after her. [She] is saved by Perseus, her future husband. ...Made with commercial fabric, fusible web, and thread sketching. 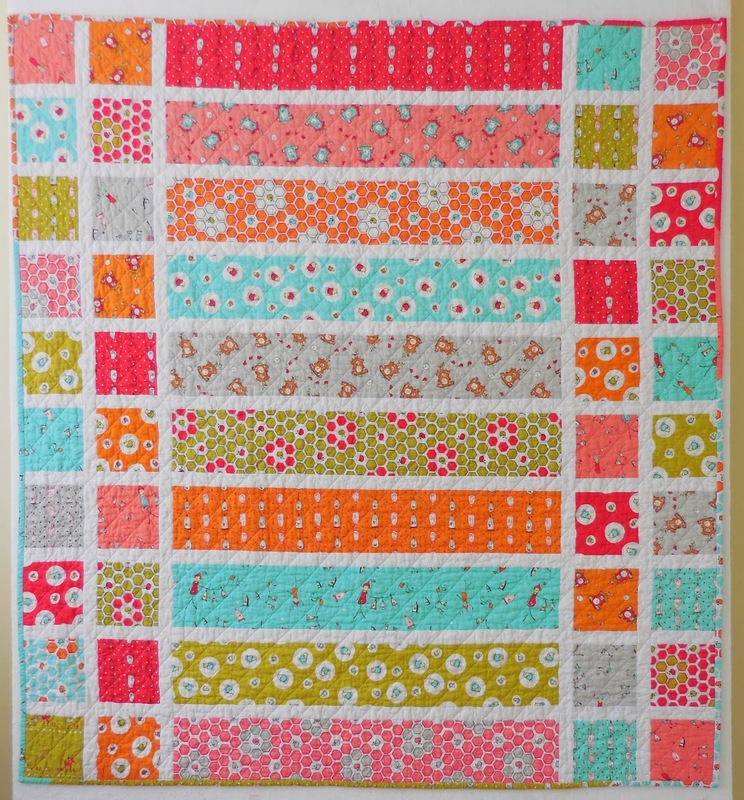 Long arm quilted. No inks or paints applied." 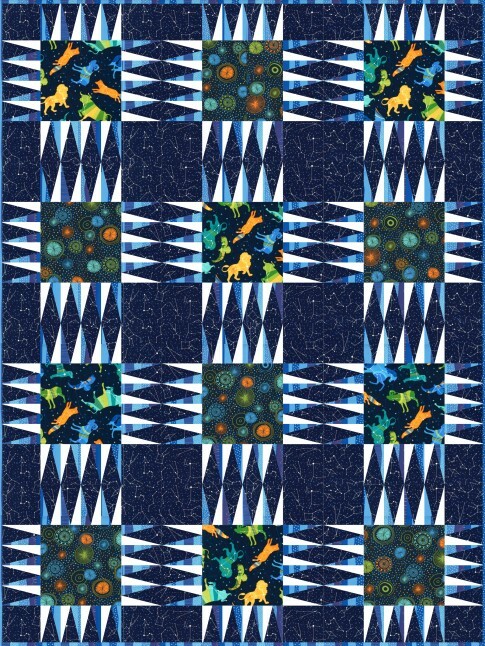 Marilyn has created a wonderfully ferocious sea monster, with the sharpest "teeth" we've ever seen on a quilt. She has really brought the myth of Perseus and Andromeda to life. Marilyn's original design is machine appliqued and machine quilted. Jane notes, "As the song says, the diamonds are in the sky and the inspiration came from an art nouveau calendar. 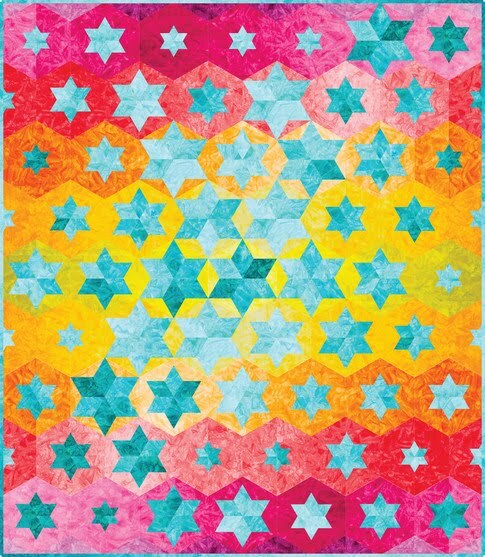 Techniques include hand-sewn hexagons which are quilted by machine with a diamond pattern. The figure and lamp are machined trapunto to bring extra loft. There is also machine applique using mostly hand-dyed fabric with extra embroidery and hand-crafted cords." Close up, Littering the Sky with Diamonds by Jane Hopkins, U.K. 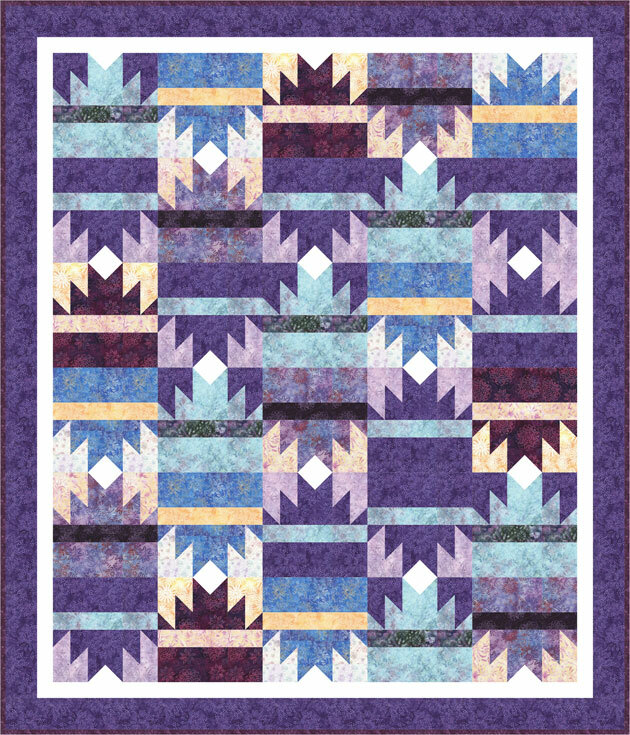 In this close-up you can see the background in deep hues, made from hand-sewn hexagons. You can also see the pretty embellishments of strands of pearls in pastel shades, along with crystals. This charming "flapper girl", reminiscent of the Jazz Age of the 1920's, looks as if she's all ready for a night on the town. 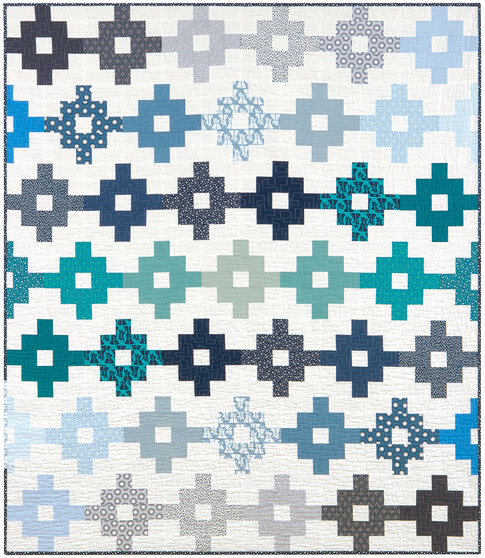 The ombre monochromatic fabrics in Tamar's quilt glow so beautifully, they look as if they are lit from behind. We really enjoyed this elegant, symmetrical piece which reminds us of a stained glass window. 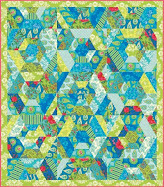 Flower Fantasy is machine appliqued, pieced, and quilted. You can see the satin stitching in black thread on the edges of the pieces. 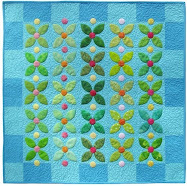 The echo quilting pattern brings out the gentle curves of the flowers and surrounding stems. 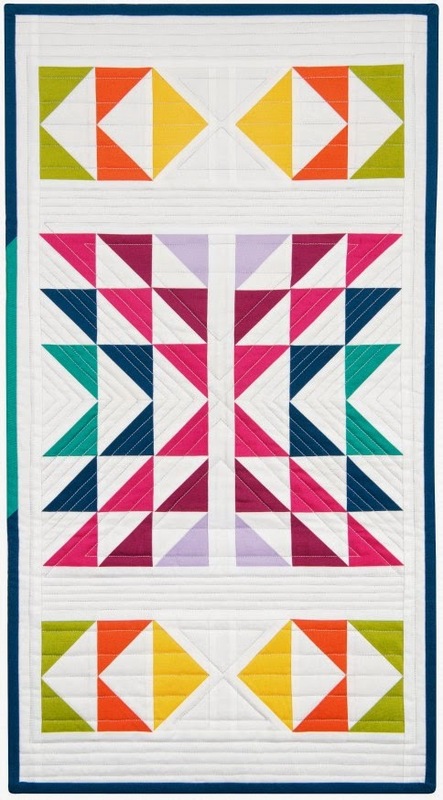 We love eye-catching quilts with all (or most) of the colors of the rainbow, and this one's no exception. 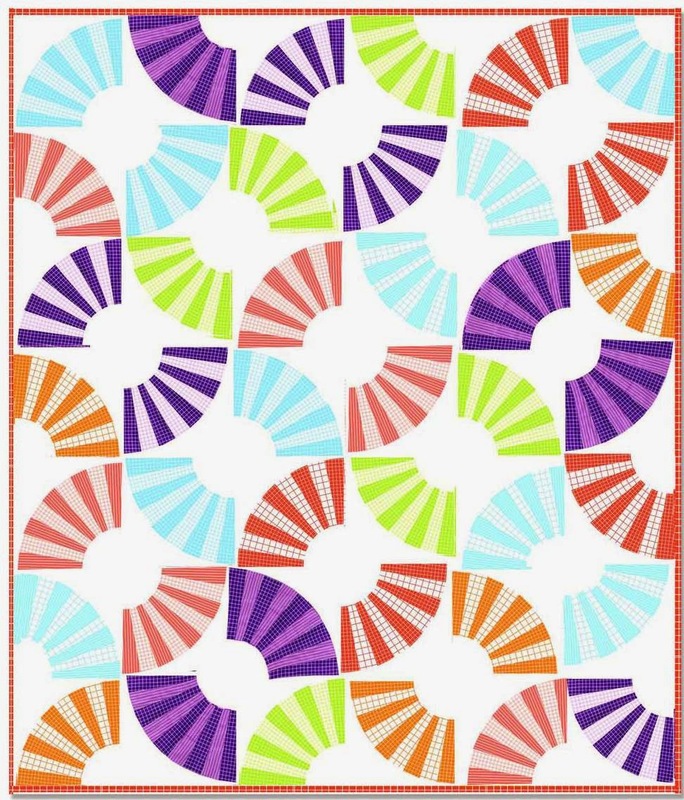 Look at all the different fabrics in this energetic contemporary spiral! It must have been so fun and so rewarding to design and piece this vivid modern work. 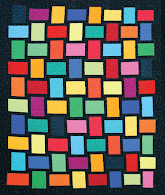 Tamar's vibrant creation is appliqued, pieced, and quilted by machine. She's made excellent use of blended deep blue fabrics with lighter tints as a neutral background to showcase these radiant colors. 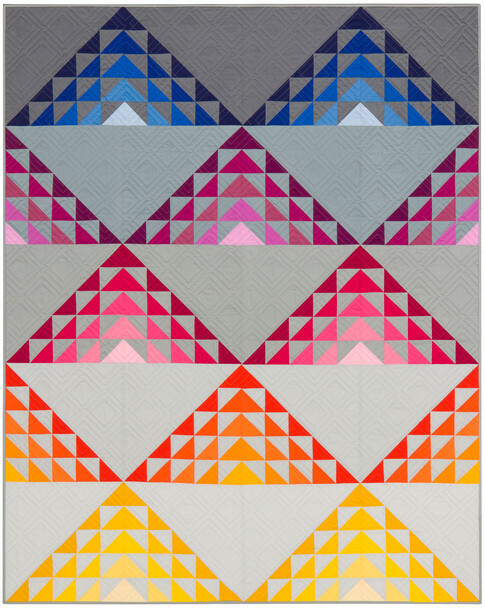 Blue ribbon winner for Best Use of Color in the Innovative category, Atsuko's dynamic contemporary quilt exemplifies the "Big Bang" theory of the creation of the universe. As the star is born from a whirling, circular vortex, chunks of angular ice and rocks fly around it. Atsuko's original design is all hand pieced, hand appliqued, and hand quilted. She's done a stunning job of juxtaposing cool silver grays, blacks, and glacial whites, with warm rust, cinnamon, tangerine, and apricot hues.